The galea was the essential Roman helmet, yet over the period of Romes existence, its design changed considerably. This NiederMormter Imperial Italic Helm is a design thought to have been based out of Italy, with loose Celtic designs as inspiration. This particular helm is also not without its own little touches, adding a unique sense of style (and even a bit of humor) to the design, as well. The helmet, like the classic Imperial helm, features a round skullcap that is further accented with brass strips, as well as a central brass ring at the cap. 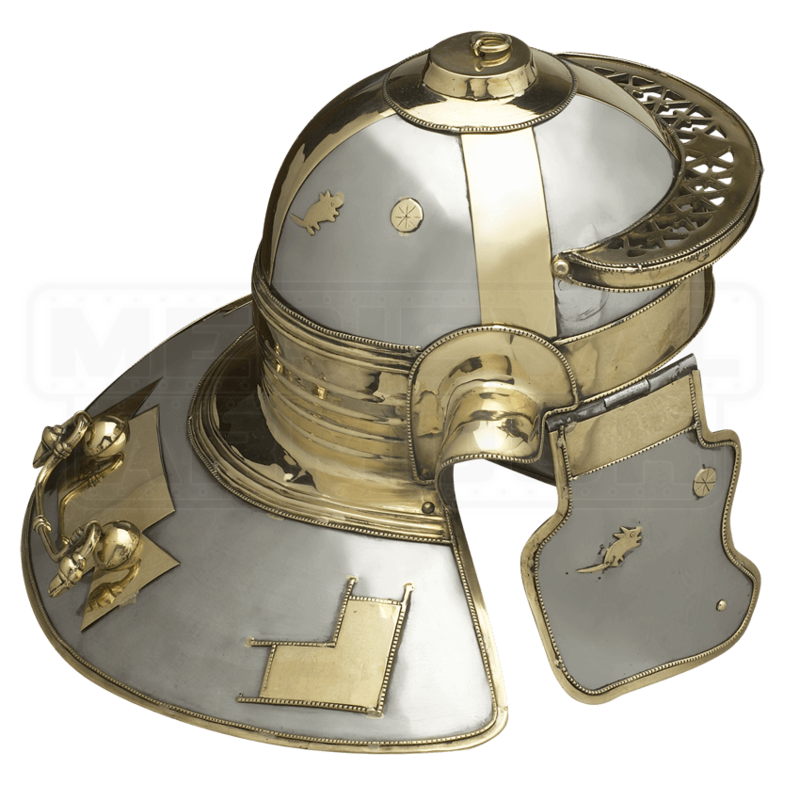 A matching brass visor adorns the brow, and unlike the Gallic models, this helmet also lacks the stylized eyebrow designs, too. It does, however, feature open sides and an open face, retaining the hinged cheek protectors that offered so much freedom. A handle adorns the back ridge, and as decoration, little touches of brass adorn the helm, the protectors, and more. The helmet is made entirely in 18 gauge steel, and accented with polished brass touches. Easily, though, the most novel part about this NiederMormter Imperial Italic Helm is the brass mouse and wheel accent, found on both cheek protectors, and on the cap, adding a little sense of stylized design to what is otherwise a classic and iconic looking Roman helmet.